Note: This post is random. It’s about a friend who made a vidcast, which wasn’t what I expected, which made me realize that my toy was really something that could help people with a disability – which made me think – if Apple can help and if Apple is selling millions of products – why aren’t they helping? I digress… here’s the post. So I have a friend at work. She hosts our Revolve Tour Events (shameless plug – if you have a teen girl she really needs this event, btw) and I just adore her. Her name is Courtney. See –> isn’t she darling! ANYWHO – she is one of those people who KNOWS how to live. She wears a smile at all times (minus the above picture, where she is too preoccupied sticking my statue of a hand up her nose) and her personality is bigger than my pug (which he is PRETTY BIG). And that’s a good thing. Well my pug being huge isn’t good – but Courtney’s personality is. Anyways, one of the projects we work on together are vidcasts for our Revolve Tour audience. Courtney is always a ball of fun. I always anticipate a lot of laughter when watching her stuff. A few Mondays ago, I sat down opened her email, clicked the link to watch her latest vidcast…. and then proceeded to SOB. Courtney had been working at a camp where she said she would tape a vidcast. The vidcast is of a friend she had met named Koren. Koren is trapped in her body. Her central nervous system just doesn’t work. It appears that nobody is home, but somebody is home. Her friend, Koren’s sister – Alexis was there to help her communicate with Courtney – get this… she communicated via an iPad. I sobbed while watching this. Then I started researching iPads and disabilities – and I started to realize the magnitude of this technology. Here is the post from Courtney – if you feel like you needs a good cry – I WARNED YOU. So all of this had me thinking…..
Can this iPad that I play ANGRY BIRDS with really help someone in need? Apparently YES and in a big way. And it’s not just iPads, iPod Touches have helped assist the disabled for a while, and the iPad with the size has increased usability. This is a great website dedicated to covering all Apple products wit a slant towards disability. San Francisco Weekly featured a post last week on a Autistic child and his iPad. Also on the development and study of autism and usages of the iPad. While I hate that some people down the idea of using the iPad – it’s the media and news and SOMEONE is bound to disagree. Reading thru the comments, you can see people respond on how their child with special needs or autism are using the iPad and seeing success. While some of us think of the iPad as an expensive toy – the thought of this device being able to help a person with autism or a person with a disability amazes me. Does anyone know if Apple offers a discount to people with autism or a disability? If not. Steve Jobs and Apple – you should step up. Here these voices. See the opportunity. Embrace what your technology can do for those less fortunate. And make your tribe love you even more. iHelp? Please? Hey, it’s worth a try. 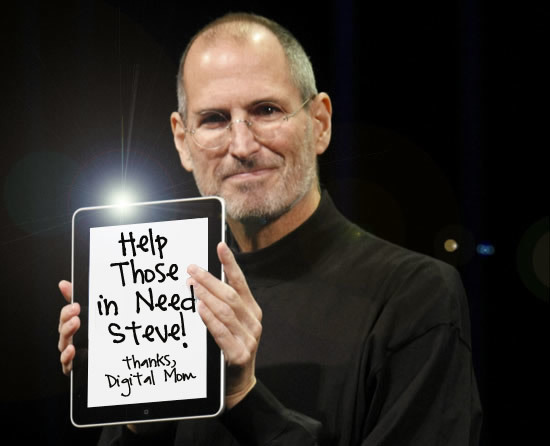 Steve, be more than a technology changer – be a life changer. Apple has sold 3.27 million iPads in the first 3 months of it’s release. I think that means there is plenty of money in the bank Apple. Do it. Young Life Capernaum gives young people with mental and physical disabilities the chance to experience fun and adventure, to develop fulfilling friendships and to challenge their limits while building self-esteem through club, camp and other exciting activities. Young Life staff and volunteers model Christs unconditional love and acceptance as they walk alongside these young adults  filling their lives with love and support. Disclaimer: I work for Thomas Nelson Live, who produces The Revolve Tour. Opinions expressed here are mine, and mine alone. I’m a blind college student under Vocational Reabilitatio Services threw my state of Alabama right? They help people with disabilities obtain assistive technology, job coaching, independent living, job evaluation, house and board, books, college assistance, etc just tell your friend in her state to contact their state local VR oice n their phone book. They will setup an appointment to have your disability verified threw a specialist like my retina specialist in Dothan, Alabama to ensure that you aren’t cheating the system and will make a file with you. So, you then have training and an assessment with wht you want to do with said such tdechnology. If your friend wants it purely for leisure, then they won’t buy it like they should as the money wuld affectively be wasted. Hopefully this helps you out man. Hi! I have been wondering the same thing. I don’t think they do or do they?